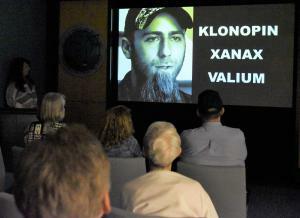 Award-winning Truth About Drugs documentary film is shown at FDFW Florida downtown Clearwater headquarters. CLEARWATER, FLORIDA, US, March 30, 2019 /EINPresswire.com/ — The Foundation for a Drug-Free World (FDFW) Florida chapter offers weekly informational seminars to the public, at no cost. The seminars use the group’s Truth About Drugs education materials, delivering real information about drugs, their short-term and long-term effects, and the dangers of drug abuse. Seminars are held every Wednesday at 7:00PM at the Foundation for a Drug-Free World Florida’s information center located at 41 North Fort Harrison Avenue, Clearwater, Florida, 33755. Each seminar takes up a specific drug: marijuana, alcohol, prescription drugs, synthetic drugs, opioids and more. Seminar speakers also discuss how to recognize the signs of drug abuse and how to talk to your kids about drugs with attendees. Per a study done by Colombia University, seven out of ten teenagers have been offered an illegal drug. However, per the National Institute on Drug Abuse, teens whose parents talk to them about drugs are 42% less likely to use drugs. “It is important that parents get educated and get the facts, so they can talk to their kids about drugs,” said Julieta Santagostino the President of the FDFW Florida chapter. The events are always free, and refreshments are served. Youth are encouraged to attend, along with their parents. Contact the FDFW center to RSVP at 727-467-6962 or email info.fl@drugfreeworld.org.